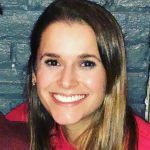 During the summer, I have a few pretty standard meals that I rotate through for breakfast: Cereal, yogurt, fruit, smoothie, etc. Pretty much anything that is light, cool or refreshing. These items are all easy to put together fast and great on the go (except cereal – that is not easy on the go – unless you eat it dry). But as the weather gets colder, my cravings at breakfast totally change. Something to wake me up and prepare my body to brave against the cold day ahead. Eggs, bacon, pancakes, waffles, oatmeal – warm, delicious items that make you feel warm and fuzzy inside and out!! 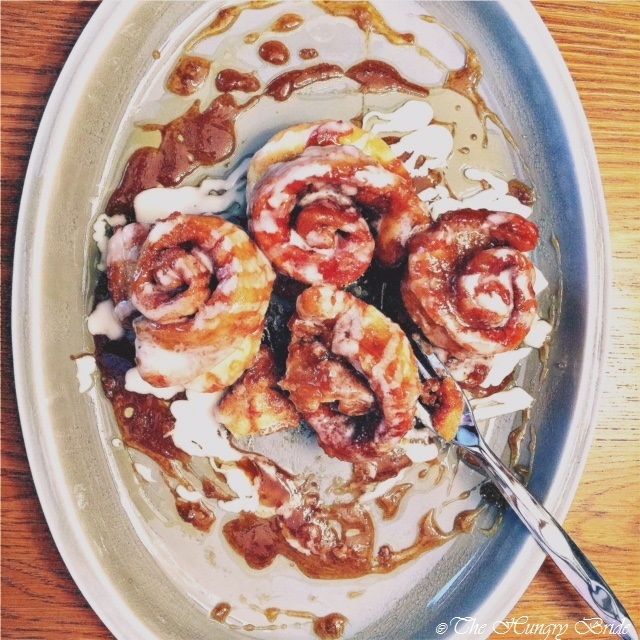 Warning: These sticky buns are INCREDIBLY ADDICTIVE – and unfortunately, not dietetic. But you deserve it!TREAT YO ‘SELF! 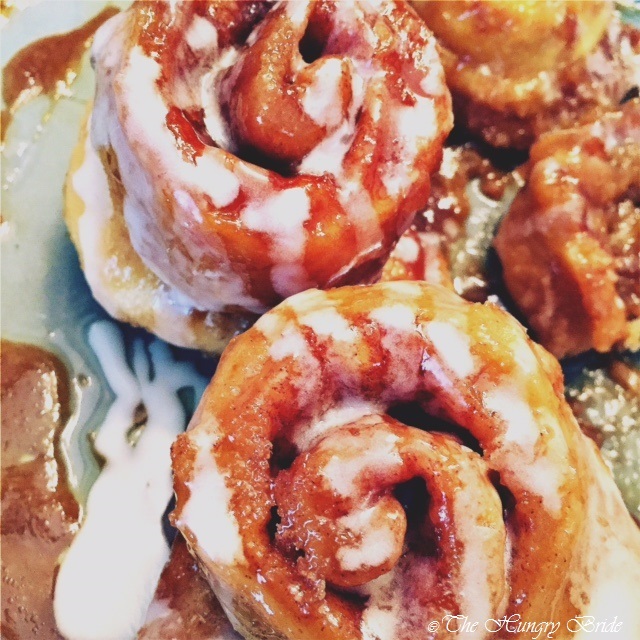 These amazing sticky buns are SO easy and SO scrumptious!! One bite will just not be enough. Soft, doughy rolls, filled with gooey, cinnamon sugar – then soaked in thick creamy caramel, brown butter sauce – they are perfect without any further additions. However, feel free to add a few handfuls of chopped walnuts or pecans to the mix for an extra crunch! Preheat oven to 300F – take out 9 X 13″ non-stick or pyrex square pan, set aside. In a small bowl, combine granulated sugar and cinnamon (and pecans, if desired) – stir until fully combined, set aside. Dust a clean surface with 1-2 tablespoons flour for rolling – one loaf of bread dough at a time, knead dough together and roll out into a rectangle – about 1/4 inch thick and with smaller width of 5-6 inches. Heavily coat top of dough with cinnamon sugar, and press lightly (so cinnamon sugar somewhat sticks). Carefully roll dough so that the longer side remains long. Set aside and complete process with second and third loaves. Once all loaves have been “cinnamon sugared” and rolled – place butter in a medium sized saucepan over medium heat. Stir until fully melted. Add brown sugar one cup at a time, stirring until melted. Turn heat off. Add heavy cream to saucepan – stir until fully combined, let sit in saucepan for 2-3 minutes (we want the mixture to cool so you don’t burn yourself, but not enough for butter to re-congeal). This is our caramel! Pour caramel into 9 X 13 pan, spreading evenly so that entire pan is covered. Back to our cinnamon sugar loaves! Slice each loaf into “buns” – about 2-3 inches thick (about 6-8 per loaf). 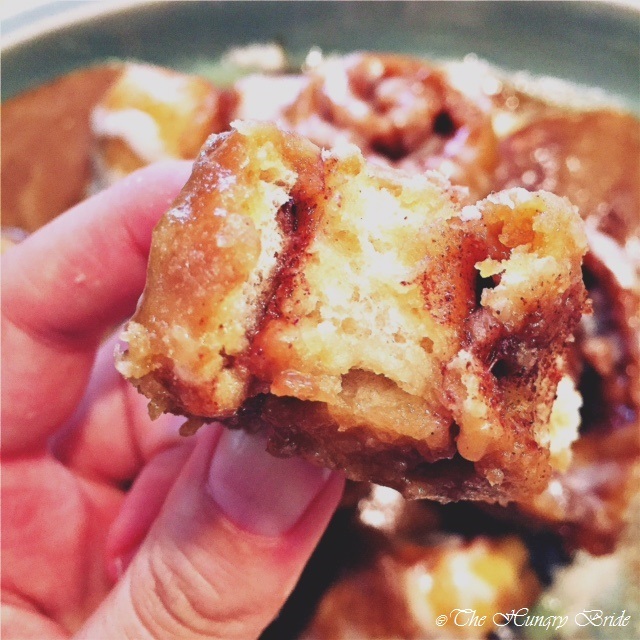 Place buns cinnamon-sugar-swirl-side down (yes, there are two cinnamon-sugar-sides! So one will be facing down, the other up) into caramel – evenly spacing throughout pan. (The buns will expand into one another so don’t worry if they are not touching just yet!) Sprinkle with extra pecans, if desired. For best results, refrigerate entire pan for 1-2 hours, allowing buns to re-rise (since we previously kneaded the dough). Note: I have made these buns without allowing for rise time and they honestly still turned out delicious – just not quite as fluffy. Bake sticky buns for 45 minutes at 300F, or until bun tops begin to brown slightly. Remove from oven and allow to cool for 15-20 minutes – this is the MOST important step!! 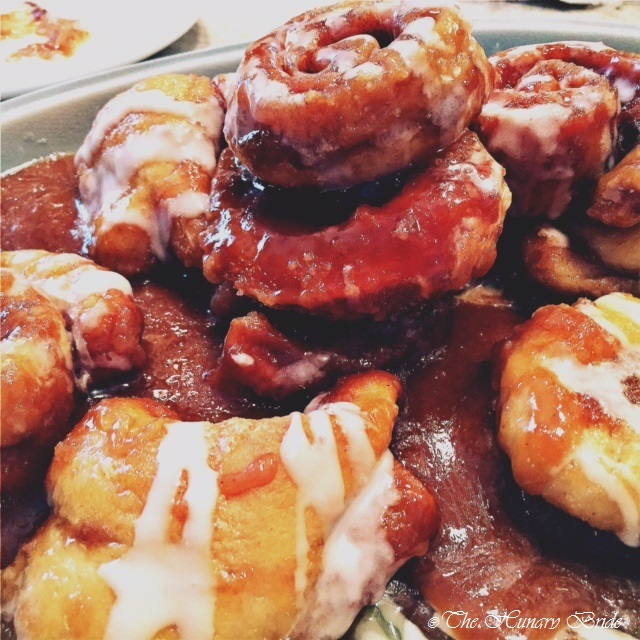 Cooling allows our caramel to “caramelize” on the sticky buns. To make sugar glaze: In a small bowl, combine confectioners’ sugar, heavy cream, and vanilla – stirring with fork or whisk until fully combined. Remove sticky buns from pan – Drizzle with extra caramel and/or sugar glaze. Serve warm, caramel-side up or down, with milk or coffee! Note: Extra caramel tastes AWESOME drizzled over ice cream, brownies, apple pie, or literally anything else. Storage: Refrigerate in air-tight container for 3-4 days.